This out-and-back trail near Flagg Ranch, follows the Snake River to Yellowstone’s South Entrance. The hike begins through a meadow along the river, then enters a stand of trees. 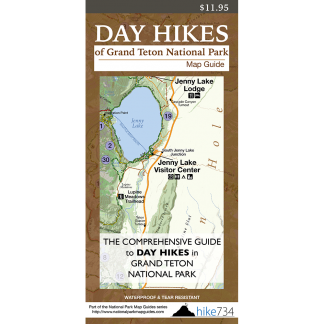 While the trail crosses through a few open, grassy meadows, it primarily spends its time in a lodgepole pine forest just out of sight of the river. There are, however, ample opportunities to step off trail to see the river. Here the trail gains some elevation and the river passes through a beautiful gorge. Eventually, the trail leaves the river and nears the road. This trail parallels the highway, thus faint traffic noise can be heard during most of the hike. The trail makes its way back to the river at a boat launch that serves as the northern trailhead for this hike. Turn around here unless you’ve arranged a vehicle shuttle. Trailhead: From the Headwaters Campground follow a trail from the southeast end of the campground to the boat launch at the Snake River. At the boat launch, follow the trail under the bridge, then continue along the north shore of the river’s edge. 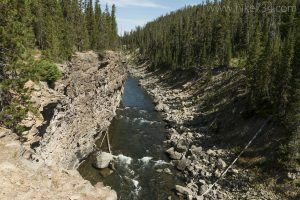 The northern trailhead can be found in the picnic area and boat launch 0.6mi/1km south of Yellowstone National Park’s South Entrance.